Source: ECB, Structural Financial Indicators. Total branches in destination countries are defined as the sum of branches of domestic banks, branches of banks from other EU member states, and branches of banks from all areas other than the EU. Source: ECB, Structural Financial Indicators. 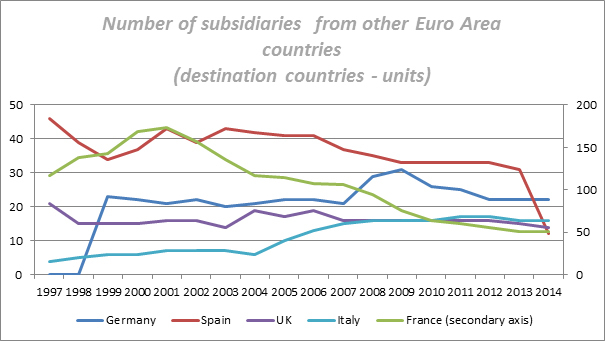 Total foreign branches in destination countries are defined as the sum of branches of banks from other EU member states and branches of banks from all areas other than the EU. Source: ECB, Structural Financial Indicators. Source: ECB, Structural Financial Indicators and MFI Balance Sheet. 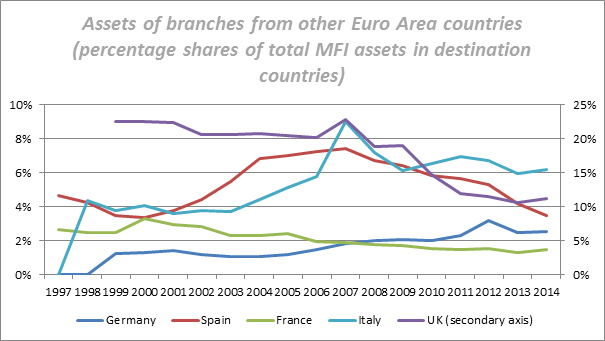 Ratio between total assets of branches from other Euro Area countries and total assets of MFIs in destination countries. Source: ECB, Structural Financial Indicators and MFI Balance Sheet. 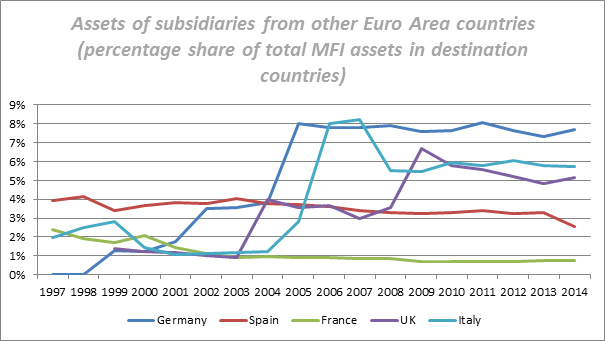 Ratio between total assets of subsidiaries from other Euro Area countries and total assets of MFIs in destination countries. Source: ECB, Balance Sheet Item. 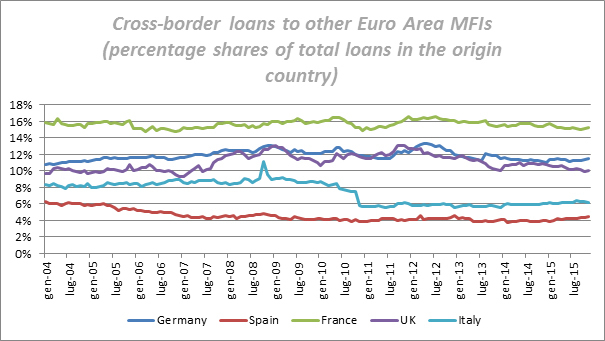 Loans (end of period, outstanding amount) by national MFIs vis-à-vis MFIs resident in the Euro Area (changing composition) as a share of total loans of national MFIs in originating countries. Source: ECB, Balance Sheet Item. 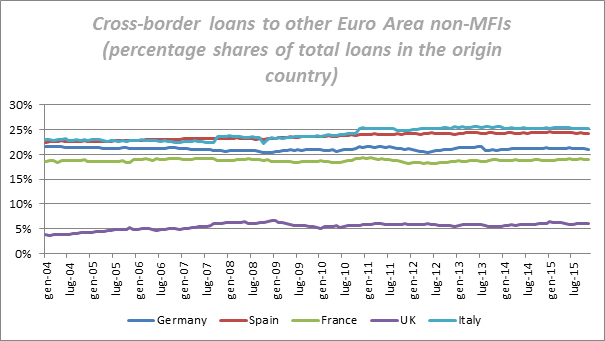 Loans (end of period, outstanding amount) by national MFIs vis-à-vis non-MFIs resident in the Euro Area (changing composition) as a share of total loans of national MFIs in originating countries. Source: ECB, Balance Sheet Item. 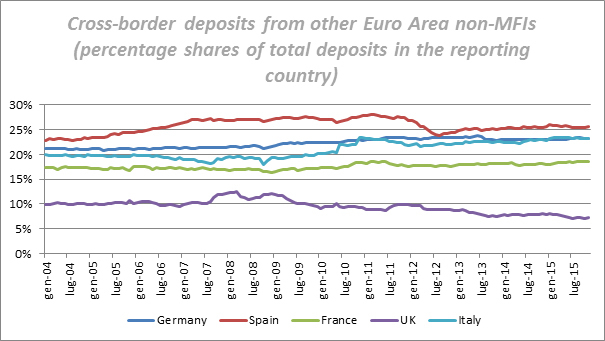 Deposit liabilities (end of period, outstanding amount) to national MFIs from MFIs resident in the Euro Area (changing composition) as a share of total deposit liabilities received by national MFIs in destination countries. Source: ECB, Balance Sheet Item. 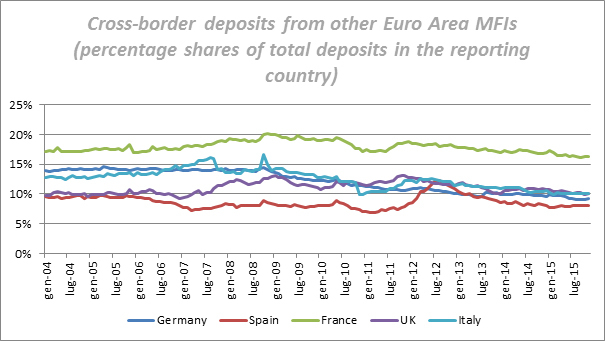 Deposit liabilities (end of period, outstanding amount) to national MFIs from non-MFIs resident in the Euro Area (changing composition) as a share of total deposit liabilities received by national MFIs in destination countries.